Note: This section is for developers who are not using Storyboards. If you use Storyboards for your project, then you can customize the layout for your table cells directly in the Storyboard editor. Visit Ray Wenderlich's excellent Beginning Storyboards in iOS5 tutorial for an intro. 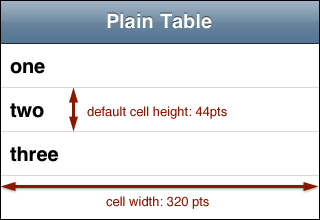 If you want to create your own custom table cell styles, you'll need to replace the cell's contentView with your own views. This can be done programmatically by modifying the tableView:cellForRowAtIndexPath: method, and creating new subviews (buttons, labels, background images) when you initialize the cell. The cell's backgroundView goes behind all the other views. 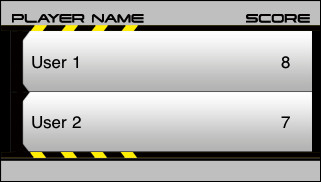 If you set a custom background on a plain style table, the background should be 320 points wide. 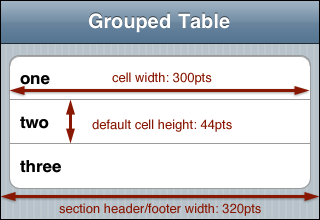 For grouped tables, cell backgrounds should be 300 points wide. The tableView:viewForFooterInSection: and tableView:viewForFooterInSection: methods may be called frequently as the user scrolls the table, so it's best to return the retained view, rather than recreate it every time the method gets called.